1.Cut out an 8 x 8 inch square of parchment paper. 2.Place the parchment paper in the bottom of an 8 x 8 inch baking dish. 3.In a large sauce pan, add the butter, brown sugar, and honey. 4.Place on the stove over medium-low heat. Stir occasionally with a large spoon until it begins to bubble. 5.Once bubbling, cook for 2 minutes while stirring. 6.Remove from heat and stir in the vanilla and pinch of salt and oats. Stir until well coated, then mix in the mini marshmallows. 7. Pour mixture into the 8 x 8 inch dish. 8.Press the mixture evenly into the dish. 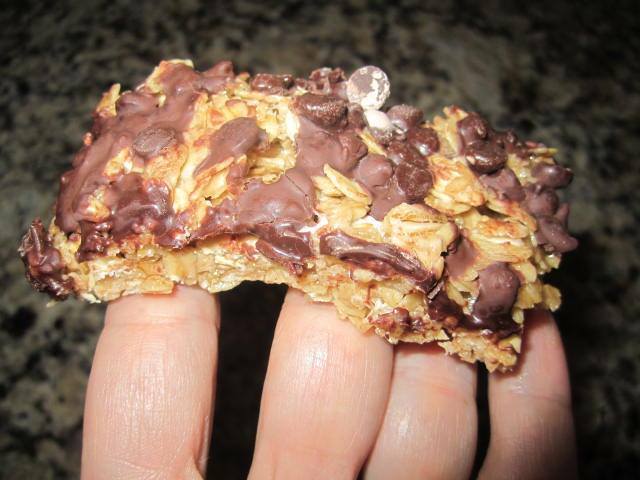 9.Sprinkle the mini chocolate chips over the top and gently press into the granola bars with your hands. 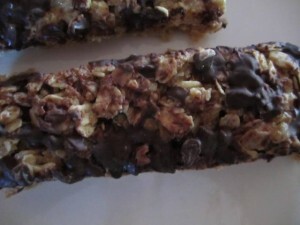 10.Allow to cool and then cut into bars. 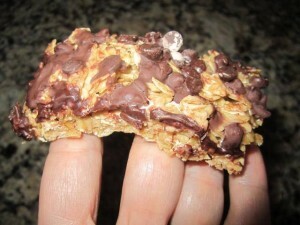 Makes 12-16 granola bars.